Today was Shanice’s first day at the IBN. She comes to us via the UCL Neuroscience MSc programme and is joining our growing mouse song team to work on her MSc project. I’m really happy you’re here, and thrilled to do some great science with you over the next year! It’s induction week at UCL, and back to university pretty much everywhere else! I’m looking for motivated MSc students to join me for research projects related to mouse songs this year – with options to focus on studying their acoustic structure, their perception by conspecific listeners and/or their encoding by auditory neurons. The Bendor lab and the Institute of Behavioural Neuroscience form a very dynamic and welcoming environment for world-class neuroscience research, embedded in the amazing neuroscience community at University College London. If you’re interested and have any questions, please get in touch! 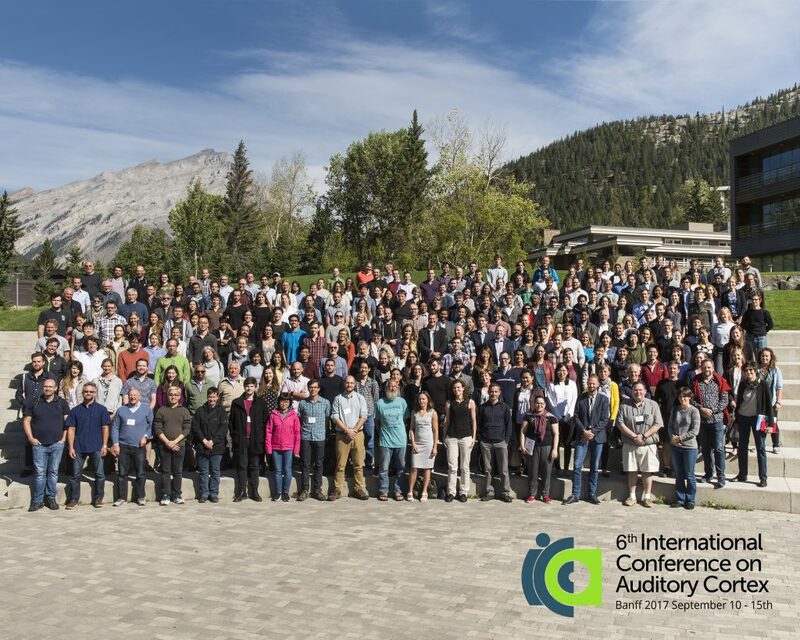 I just returned from a particularly excellent edition of the International Conference of Auditory Cortex. 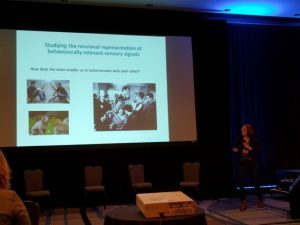 This meeting takes place every 3 years, and is a rare but unique opportunity for a worldwide gathering of scientists broadly interested in how we and other animals perceive sounds, and how the brain processes acoustic information. Over 4 very busy days, more than 300 of us listened to dozens of talks that together captured the current issues and big questions in the field, discussed our research over posters, and networked with old and new colleagues amidst the exceptional setting of the Canadian Rockie Mountains in Banff National Park. This was the first time I presented a poster on my mouse “love song” behaviour, to which Margaux contributed over the summer. I received encouraging and critical but useful feedback from my fellow researchers. This has boosted my motivation and curiosity, and I come back to the lab with plenty of new ideas and things to try! Welcome, Colombine! And farewell, Margaux! September brings change, goodbyes but also new beginnings. I’m very happy to welcome Colombine, a bio-engineering EPFL student who has just arrived in London to work on her master thesis research with me at UCL. I’m looking forward to embarking on this exciting journey with you! After 6 months of hard work and precious contributions in getting our mouse behaviour up and running, Margaux is leaving UCL to become a PhD student at the Crick, where I know she will be very successful – again! I’m incredibly pleased: for the first time, I presented my brand-new data from the line of research I set up at UCL. I was an invited speaker at the Gordon Research Seminar on Neuroethology: Behaviour, Evolution and Neurobiology. Over a sunny weekend in a small village of the swiss Alps, I was welcomed into the very smart, creative and kind community of neuroethologists. The common denominator is a focus on the quantitative analysis of natural behaviour and the underlying neuronal circuit mechanisms – whether in mice, fish, bats, birds, reptiles or salamanders. 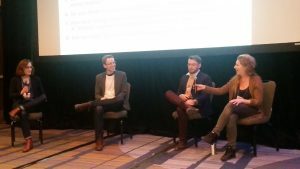 Pawel Matusz, Alex Huth, Suzanne Dikker and myself presented our symposium “Are we ready for real-world neuroscience” at the CNS meeting on Sunday. Each of us gave a 20mn talk about our own work, which made for a fun and diverse combination of perspectives on the topic, and we concluded the session with a panel discussion. It was a great experience, and very exciting to talk science with these brilliant people. Today I gave a seminar talk at the University of California Berkeley and met with members of the Theunissen, Yartsev and Gallant labs. I met fascinating people with whom to exchange views on vocal communication in primates, birds, bats and mice. I’m tired but happy with this visit! As part of their celebrations around International Women’s Day 2017, the UCL Department of Experimental Psychology has developed a one-week blog series featuring some of their female researchers. I’m proud and very honoured to join this fabulous line-up of women scientists! Read my interview here, and make sure to catch up on the thoughts of my wonderful colleagues on the EP blog. Margaux, a newly-minted EPFL engineer in Life Sciences and Technology, has just joined me on my “mouse love song” adventure at the Institute of Behavioural Neuroscience/Bendor lab. She will intern here for the next 6 months, before taking up a PhD position at the Francis Crick Institute this fall. Two heads are always better than one, and I’m very happy and excited for us to work together over the next half year! After a few weeks of trepidation I just found out that my bid for a Brain Travel Award was successful. This award funds my participation to the Annual Meeting of the Cognitive Neuroscience Society, where I will speak as part of an invited symposium. I’m looking forward to diverse perspectives and great discussions on how brains deal with complex, real-world environments. Thank you Guarantors of Brain for your generous support! … guest lecture this semester (?). I’m contributing to the Neural Basis of Perception, Memory and Language BSc course, and will give an overview of central and cortical auditory processing that builds on Stuart Rosen’s Basics of Hearing from last week!